Dental implants are permanent replacements for missing teeth. 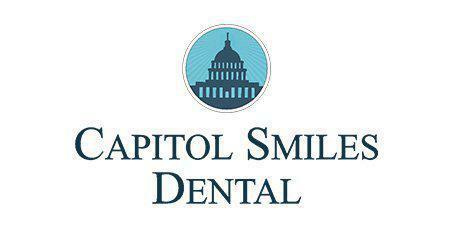 Capitol Smiles Dental in Trenton and Ewing New Jersey offers these realistic-looking implants for people who have lost their teeth due to disease, accidents, or other types of damage. Implants can make it easy to get full mouth function back. Dental implants are dental prostheses that replace teeth. Implants can be used to replace a single tooth or an entire set of teeth. Dental implants are often considered permanent alternative to dentures. How are dental implants set in the mouth? A dental implant is a metal post, typically crafted from titanium. A small hole is drilled in the jaw bone, and the post is placed in the hole. The bone adjusts to the implant, growing around it to anchor it securely. At the top of the implant, a crown is bonded in place. The crown, usually made of ceramic or porcelain, is created to look just like the natural tooth it replaces. Dental implants are permanent teeth replacements, although the crown part of the implant may need to be replaced if it gets cracked or otherwise damaged. One of the biggest advantages of dental implants is that they look completely natural, since they're modeled after the patient's own natural teeth. Another major advantage of dental implants is that they’re very secure, so patients won't have to worry about shifting as they eat or talk. Denture candidates may opt for dental implants because they look natural, are fully functional as teeth, and don't have to be removed every night. Dental implants are an excellent solution when a person is missing just a few teeth, as they can preserve natural teeth by preventing shifting. By helping the natural teeth maintain their positions, the risk of joint damage can be lowered, and TMJ pain can be alleviated as well. Dental implant candidates must have good oral health, with a healthy jaw being especially important. Most people who are missing 1 or more teeth may be good candidates for dental implants, especially if they're seeking a permanent solution for missing teeth. For patients who have gaps in the mouth causing their other teeth to shift, dental implants are often the best solution.